I just think the Revo will be easier to handle, faster, and easier to paddle in those situations when I have been in really shallow water on low tides. I spent two hours in Pineland last year pulling my yak through the mud as that was easier than trying to paddle that beast vs. the tide and wind. At least get the 13. The shorter the kayak the harder they are to track straight. I posted something almost identical a few months ago, and in the end i decided standing was too important to me to give up for more maneuverability. I still might try the paddleboard thing and see if that will do when i want to stand and then get something sleek for when i want to cover a lot of ground.. I have a PA 14 and would not change it for any other kayak,yes is heavy and all that but wen I'm out there I feel like a king so much space I don't get wet unless is really bad and many other things that I love about the PA,get a revo if u need to go faster! I have a Sport. You know how little and lightweight it is. I too spend an hour in prep and almost another hour afterwards. And I fish just across the street. A smaller kayak isn't going to help that. BUT I also have a recently acquired pickup and the loading/unloading now is a snap. I could not, in my wildest imagination, ever be capable of cartopping a PA. I agree with the fact that a smaller kayak will not force you to carry less stuff. If you're happy with the PA12, stay with it. Look into the possibility of a trailer. They make small hitches for cars and then you wouldn't have to worry about picking it up the yak to put it on top of the car. You could even find a small jon boat trailer and "convert it". I have a PA14. Most of my fishing is bass fishing, flats fishing and I'm just now getting equipped to go offshore. I go through all of the same things you do (prep time, all the gear I bring and the longer clean up time). I wouldn't change my kayak for any other yak made.............PERIOD!! The Sport was awesome for someone who isn't too heavy and is limited in storage space. I kept mine in a public storage locker while I lived in apartments. It was stable and nimble, but the lack of length meant it wasn't very efficient at cutting through the water. The 225lb limit was also a problem for me, since I weighed about 205lbs at the time and starting to take more gear. Sold the Sport for a Revolution 11. That was an eye opener. The revolution is slim and a bit tippy in comparison to the Sport (or the Outback, but more on that soon). I actually rolled it first time offshore, never did that in my sport. Since then I got used to it and love it so much, I kept it. The portability is great, I car top that kayak with no problems, and I have lower back issues! This kayak flies through the water (with turbo fins) whether its flat calm inshore water or offshore. I still use this kayak when I am doing short seatrout trips in Biscayne Bay. I only carry 2 rods, a net, a catch-bag and I use the middle round hatch for tackle. Basically, if my tackle cant fit in the hobie gear bucket, it gets left at home! For a larger kayak, I went with the Outback (pre-2015 update). I loved the stability, the amount of space, the 4 molded in rod holders, this thing is a fishing machine compared to my Revo11! What I didn't like was the weight and the mismatched handles (one side had a rigid handle, the other had a flex handle) which made it difficult to lift and balance overhead to get onto my roof racks. I didnt love the hull slap from the shape of the bow when hitting waves offshore, but in hindsight this wasn't a big deal. Then Hobie came out with the new seats shortly afterwards and I had a little less love for my Outback. Sold the Outback and went to Revolution 13 which I still own and enjoy today. It had everything I loved in the Revo11, but a bit more space and of course the new seat. I had to dial back some of my gear from the Outback-days, but I still manage to take 4 rods, a gaff, a catch-bag, fish finder, and a 5 gallon bucket for live bait. Also, this one is still manageable to lift solo and balance overhead to put on roof racks. Sorry for the long winded response, now comes the short part: If you ever want to stand and fish again, forget getting a revolution. Yes you can buy amas, but your point is to simplify things, not add parts! Next, DCR, CrackedConch, and Inshore Dave are 100% correct that buying a smaller kayak will not make loading/unloading all your gear magically easier. What will happen instead is you will get frustrated by the "lack of storage space" on your new kayak. I tell you what though. 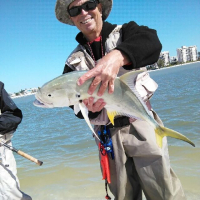 If you would like to take me to some good fishing spots in Naples or Marco Island, I would be willing to bring both of my revos so you can try one and we can switch during the trip so you can experience both. Standing up is a pretty big advantage inshore. I would go with an Outback and not the Revo. I am looking at both the new Outback and the Revolution 13. How much stability does one give up by selecting the Revolution and how much speed and Maneuverability does one gain with the Revolution? Secondly how well does the Mirage Drive and its components hold up to saltwater use? Stability: Outback wins. They made it even easier to stand in the 2015+ Outbacks because the flattened the deck a bit. Speed: Revolution wins, but not by much! With turbo fins and a light load, the Outback cruises at about the same speed as the Revolution. You only feel the difference over distance, or if sprinting. Saltwater: Saltwater corrodes everything over time, ask any old salt, but since you know that then there's no excuse for not maintaining your gear. I rinse my kayaks with freshwater when I get home and I spray wd-40 on the mirage drive chains and cables afterwards. Without that attention to detail, the exposed portion of the mirage cables can show rust after only a few trips. Jeez, one hour before and two hours after? I think there are pills you can take to reduce that time. My kayak gets rinsed when it rains (their plastic). The only thing that gets washed down is the reels, but I am going to stop doing that as I am still having to break them down every month. The non-loading time stuff is strictly your inexperience (or logistic issues, maybe you have to carry stuff a 100 yards to where you are parked) or personal issues as you already understand you take too much stuff but continue to do so. The loading stuff is the biggest issue that I take to heart. At any point where your decision to go fishing is negated due to the fact of not wanting to deal with the hassle of loading/unloading your kayak, then outside of getting a trailer etc., trade that dude in and get something lighter/easier. Whatever gets you on the water and happy is the way to go. kayak fishing is a slippery slope. So many people are out of the game because of the hassle factor. It doesn't take much and we will see that kayak and your gear on the "advertised" section. I hate seeing those. Kayak fishing rules. Not true with Hobies. The revo 11 tracks perfectly. How much do you wheigh? I sell a lot of revo 11's. They are the second best seller now next to the outback. However I never sell a revo 11 to anyone over 200 pounds. If your over 200 consider the revo 13 or the Outback. Until the wind and tide pickup. If you have never been on a Hobie they can overpower any forces of nature. I only play around with my dragonfly when there is no wind or current. Very true.. I didn't mention you need very ideal conditions to use it right. Thanks for all the replies guys, I have decided to keep it for now as I found out in the last 24 hours taht I will unexpectedly be buying a new car..:banghead I really like the idea of the paddleboard, but those Bote's are so expensive. Jeez, one hour before and two hours after? I think there are pills you can take to reduce that time. My kayak gets rinsed when it rains (their plastic). The only thing that gets washed down is the reels, but I am going to stop doing that as I am still having to break them down every month. The non-loading time stuff is strictly your inexperience (or logistic issues, maybe you have to carry stuff a 100 yards to where you are parked) or personal issues as you already understand you take too much stuff but continue to do so.